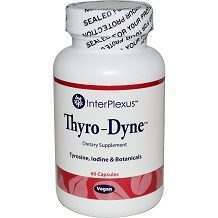 InterPlexus Thyro-Dyne is a blend of natural ingredients that support thyroid health. It contains iodine, amino acids and herbal extracts that, according to the company, enhance thyroid output and function, acting as a precursor to thyroid hormone production that helps to check weight gain. It is said to boost kidney, liver and spleen circulation. As a thyroid booster, it purportedly helps to combat muscle cramps, cold sensitivity, fatigue, menstrual problems and concentration issues among others. Read our InterPlexus Thyro-Dyne review to better assess whether it is able to deliver all these benefits. The other ingredients are vegetarian capsule (hypromellose water), microcrystalline cellulose, and magnesium stearate. InterPlexus says the blend of botanicals, iodine, L-Tyrosine, and L-Cysteine supports production of thyroid hormones. The ingredients enhance production of T4 hormone, which converts to the active T3 hormone. The company did not provide specific information on how each of the constituents contributes to produce claimed benefits. We should note that hypothyroidism (an underactive thyroid) is rarely caused, in the developed world, by lack of iodine; but taking too much iodine can actually cause hypothyroidism. So we are concerned that this product’s formula includes 147% of the RDA of iodine. Usage of InterPlexus Thyro-Dyne is quite simple. You take two capsules of the supplement per day, together with a meal, or as advised by your healthcare professional. Speak with a doctor before using the supplement if you are pregnant. At the time we researched this product, you could buy it from Professional Supplement Center online for $33.95 for a 60-count (one-month) supply. It was slightly more expensive on Amazon. After thorough research, we were not able to find information on a money back guarantee. InterPlexus was apparently still working on its website as we prepared this review, meaning its products were only available for sale on third-party websites. The lack of a manufacturer-backed refund policy will be a concern for some potential customers. For them it would be worthwhile to get details about the return/refund policy of the retailer from they purchase this product. 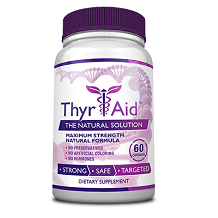 Overall, Thyro-Dyne is a passable product for enhancing thyroid health, although we cannot guarantee efficacy. The small number of Amazon customer reviews at the time of writing were all positive, but there were not enough for us to rely on them as an indicator of its potency. However, possible issues buyers may have include the lack of a company-backed refund guarantee. In addition, the description of the benefits each of its ingredients offer could be clearer. And the relatively high level of iodine is also a concern. We would suggest looking for a supplement without iodine (unless you know for sure that you are deficient in this nutrient) and one with a lower price as well.